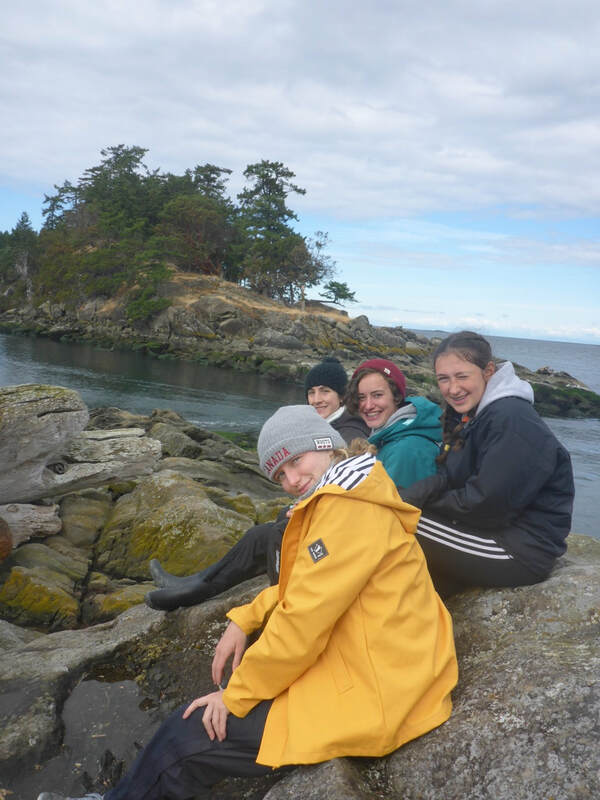 ​This September, Asta had the opportunity to accompany students from St. Michaels University School on an adventure through B.C. 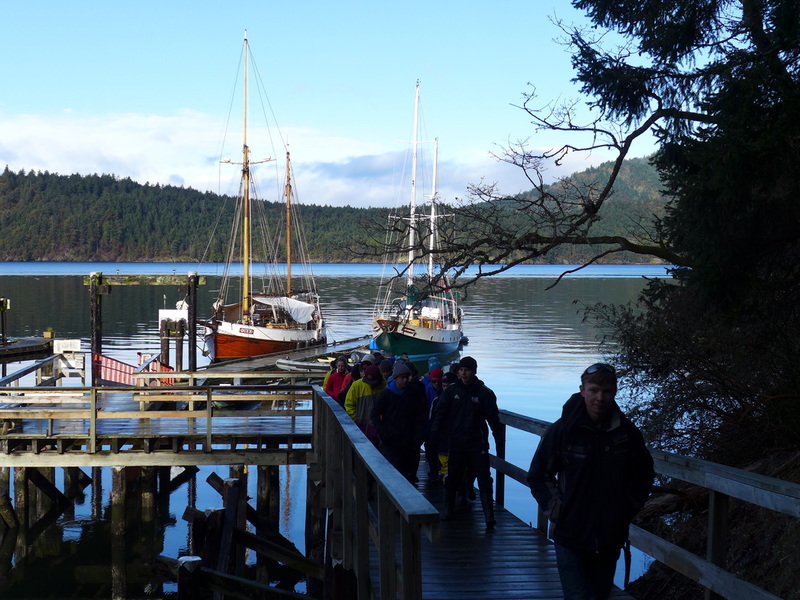 's Gulf Islands with the Sail and Life Training Society (SALTS). 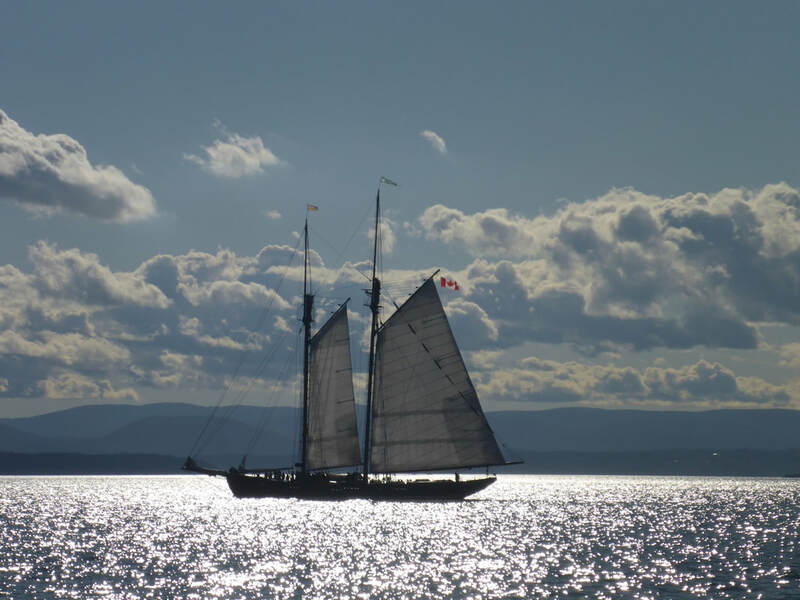 In July, Andrew and I were invited on a sailing adventure to one of B.C. 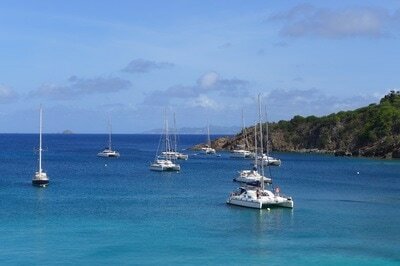 's secluded secret treasures- Buccaneer Bay. 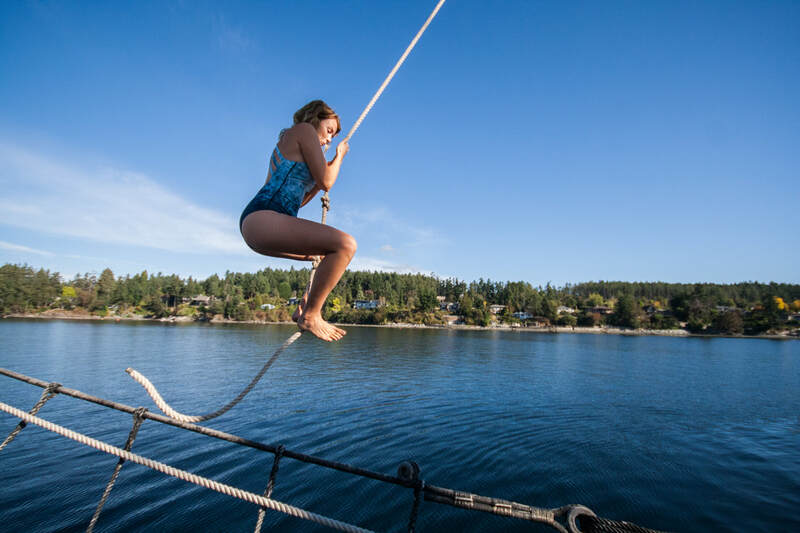 Located on the sand spit on the Southern tip of North Thormanby Island, Buccaneer Bay is a marine park, and also a holiday destination for many local families every summer. 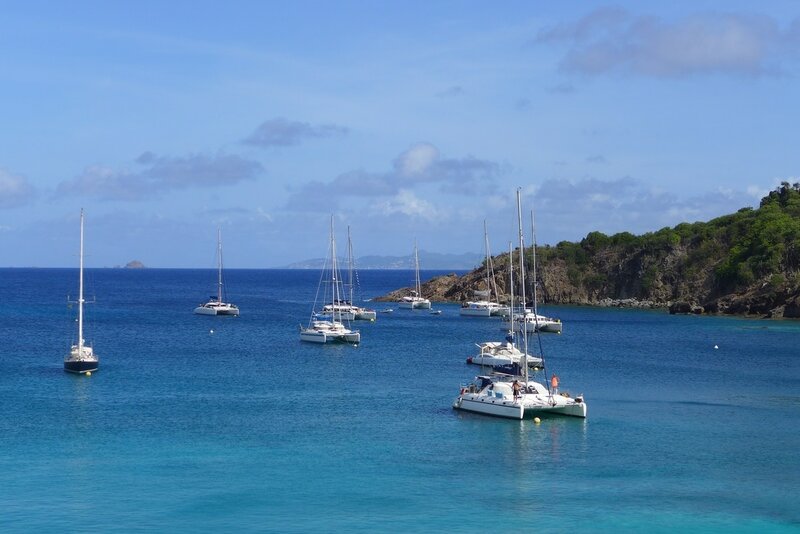 It boasts warm, sandy beaches and beautiful, clean ocean waters, as well as safe anchorage for many beautiful sail and leisure boats. 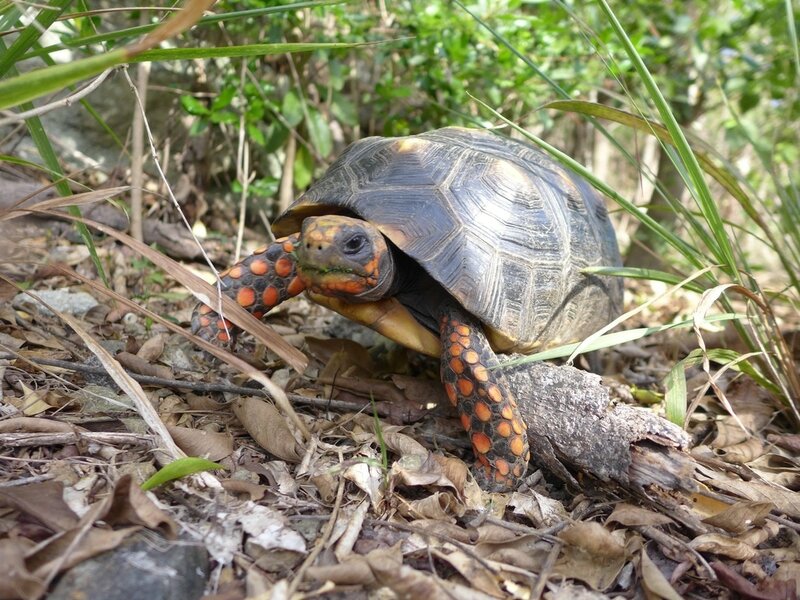 It's a great place to hike, explore, and even camp in the summertime. Asta exploring the remote corners of Buccaneer Bay. After hiking around the winding trails, doing yoga on the beach and eating freshly dug clams, Andrew and I decided to go for a kayak around the secluded waterfront. 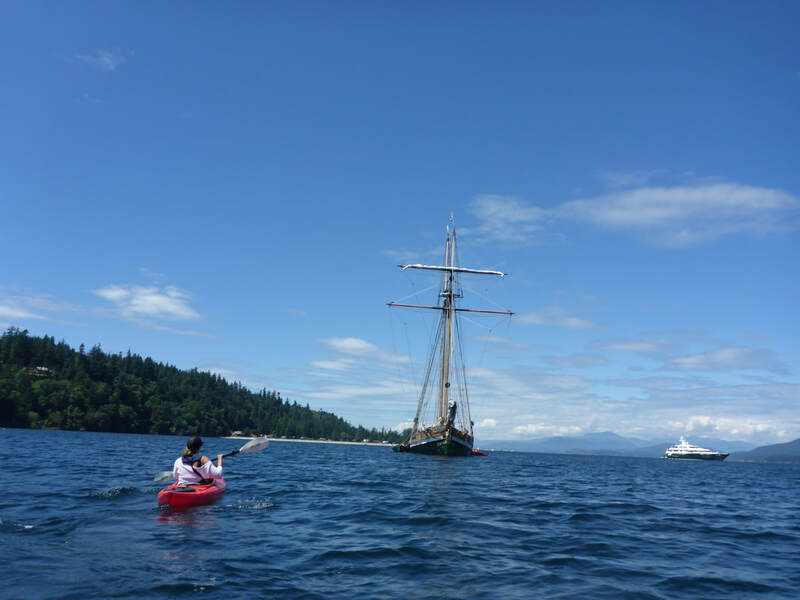 As we started paddling, Andrew recognized a familiar outline on the horizon-the tall ship Pacific Swift! The ship pulled into Buccaneer Bay and set anchor between the shores. We paddled over to take a peek. The ship looked immaculate. The woodwork glistened beautifully in afternoon sun. The bosun was hard at work repairing the net under the bowsprit. 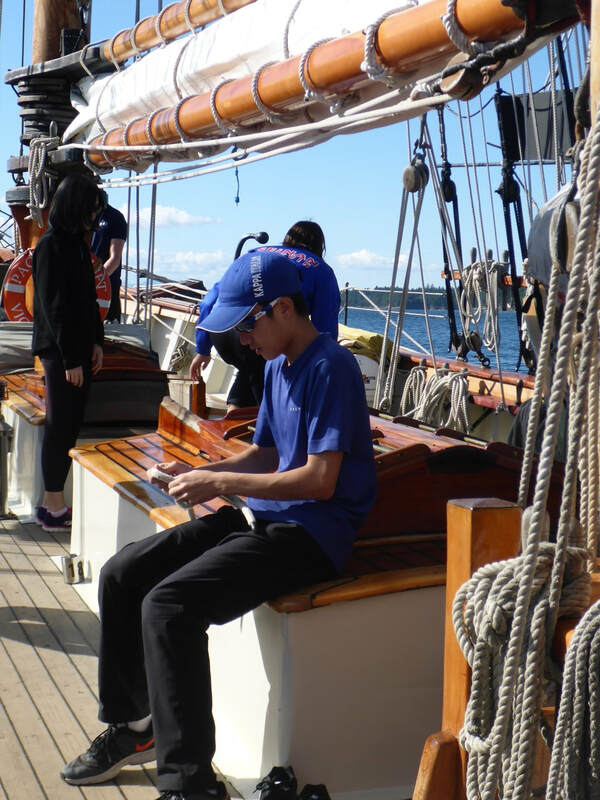 Students were relaxing on deck, their lunch plates in hand. Some were practicing knots, and others were pouring over a chart. Everyone seemed happy, relaxed and excited. 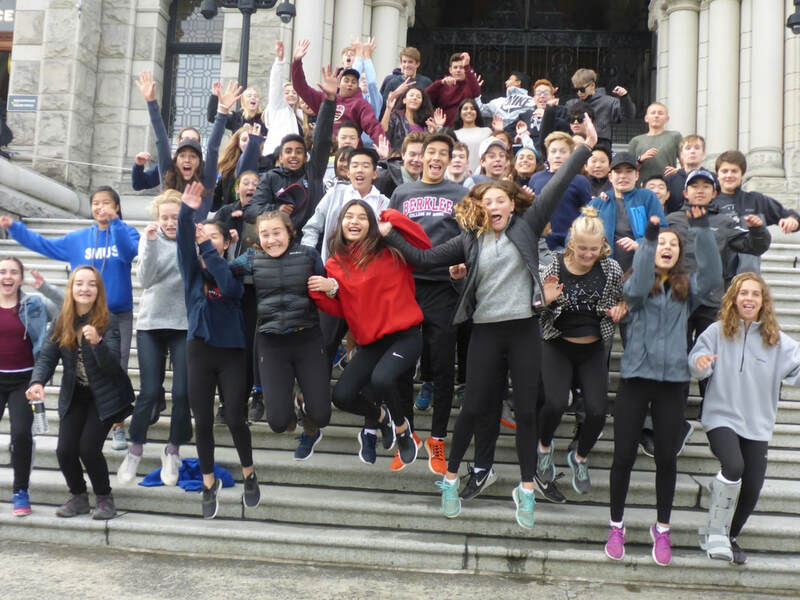 Andrew was thrilled to see the Swift, as he had been both a student and a chaperone for the SALTS program in his time with St. Michaels University School. He speaks of his time with SALTS as some of the most formative experiences in his educational career. Fascinated, I knew I had to find my way onto a SALTS program one day. Little did I know that just a couple months later, I would find myself waking up on board on board the Swift, comfortably anchored right near my house! 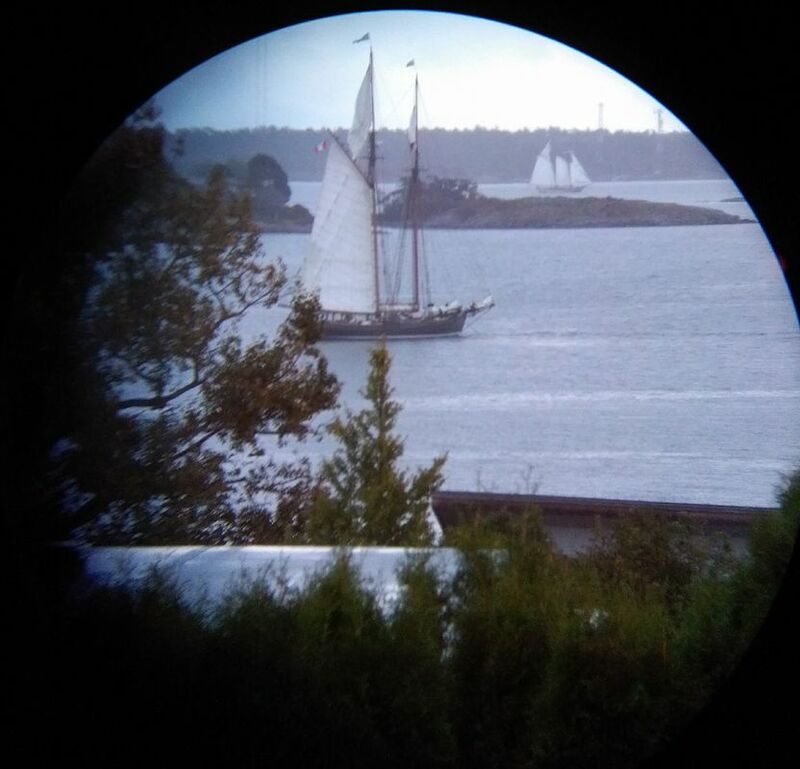 Andrew took this photo of the Pacific Swift and her sister ship, Pacific Grace, from our living room window! 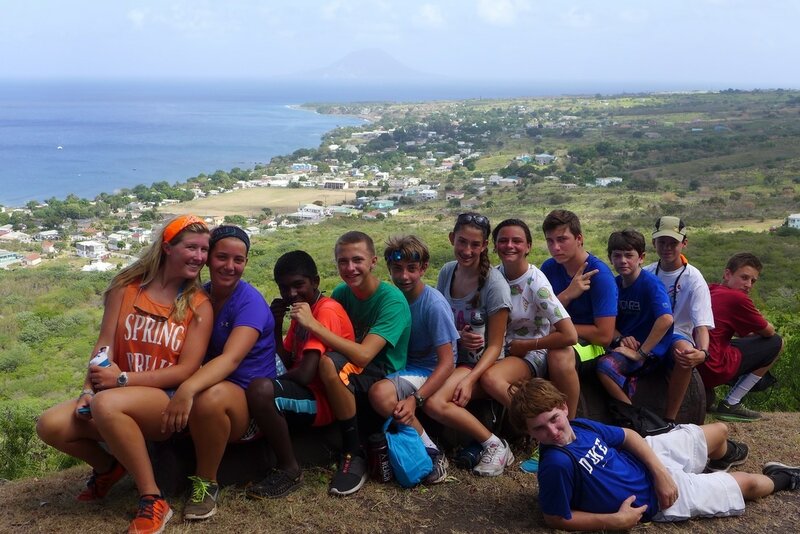 I was lucky enough to be asked to work with St. Michael's University School this summer as an activity coordinator. 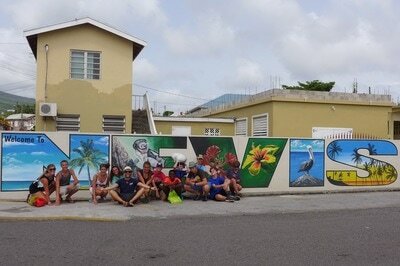 My job was to make fun things happen with a group of amazing students from all over the world. 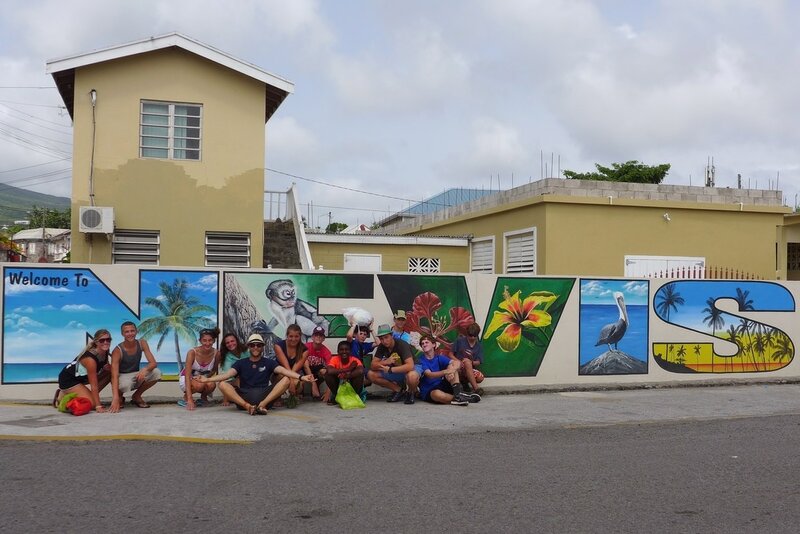 We went camping, surfing, caving, and visited all the best tourist activities the island had to offer. 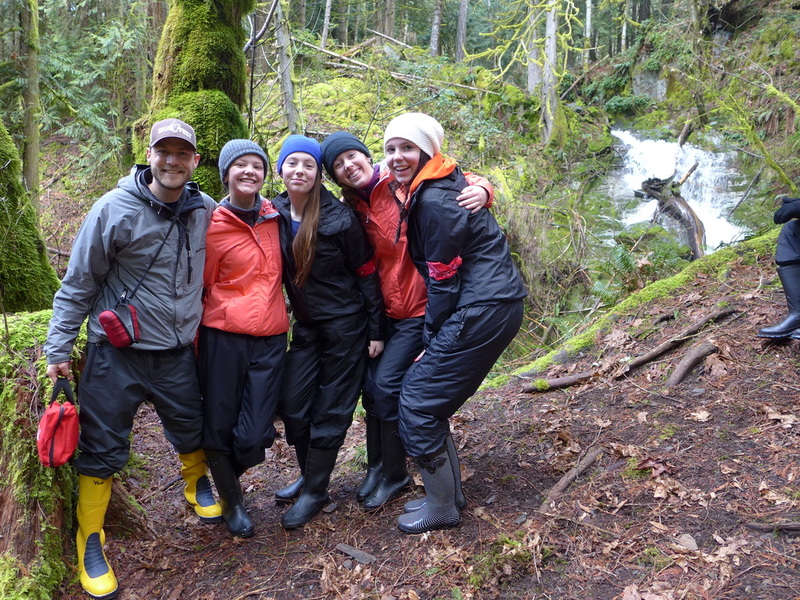 As a part of that awesome job, I got to coordinate with the school's experiential education department. 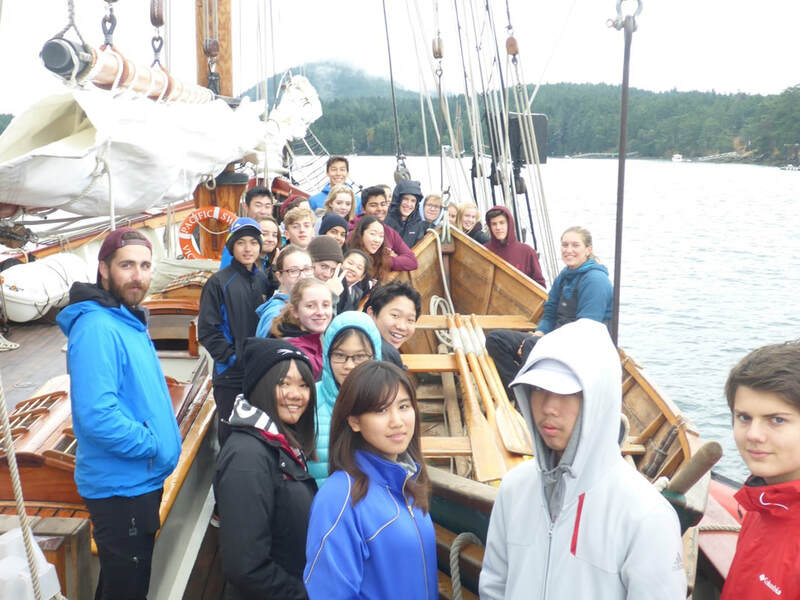 Experiential Program leader Pete McLeod had heard about our round-the-world adventures with Class Afloat and offered me opportunity to accompany the SMUS Grade 10 students on a part of their experiential learning activities on board the Pacific Swift with SALTS. ​I don't even think I took an extra breath before saying yes! 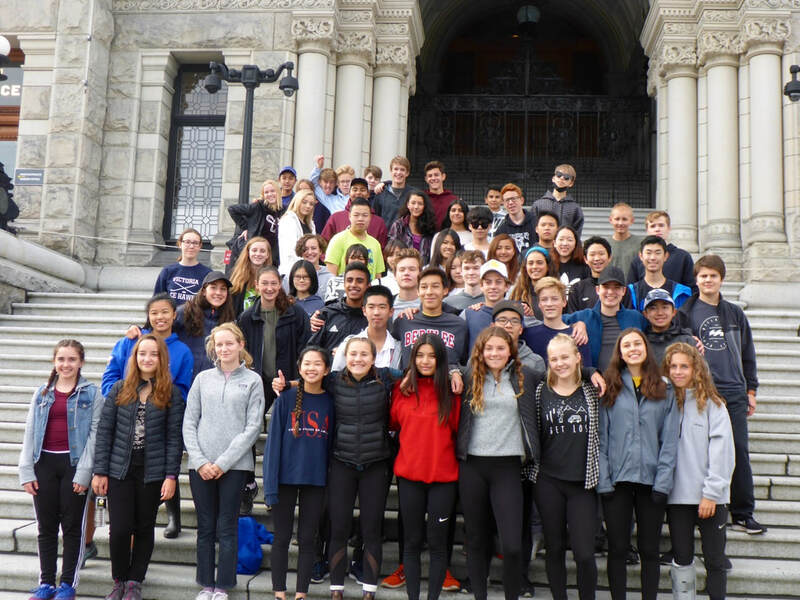 Grade 10 SMUS students on the steps of the Victoria Legislature before departing on the Swift and the Grace for a 5 day adventure! On a beautiful September morning, we headed to the Victoria Inner Harbour to meet the Swift and the Grace. 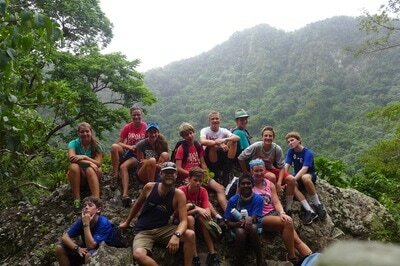 The students were pumped, the gear was packed, and the forecast only predicted two days of rain that week. For BC, this was a very big deal! 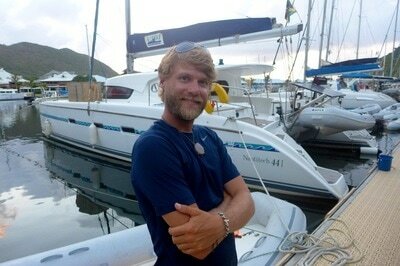 We were met and welcomed on board by the Skipper, Tristan Radley. Tristan introduced us to the ship and gave us a short safety briefing before handing off the tours to his First Mate, Steven Atkinson, as well as the Bosun, Cayla Wolever and the Watch Officer, Cayla Coleman. We split into groups to get a closer look at our new home for the next five days and go over some of the important safety rules and precautions. 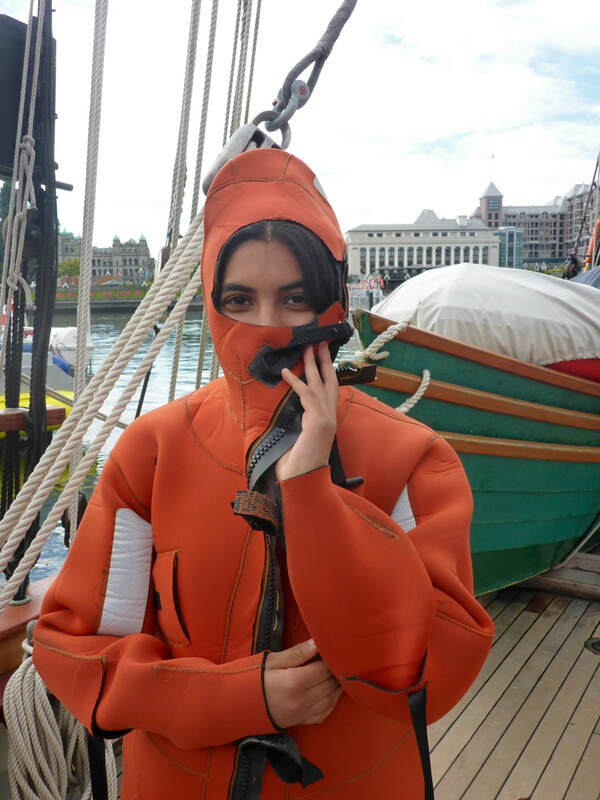 A student trying on the ever-attractive immersion suits. These are worn if the ship is in imminent danger and being in the water may become a reality. The students were put straight into three watches, and a group began immediately on deck to help with getting the ship off the dock. The crew members were calm, confident, and easy going, which made the kids relax and know, right from the start, that they were in good hands. 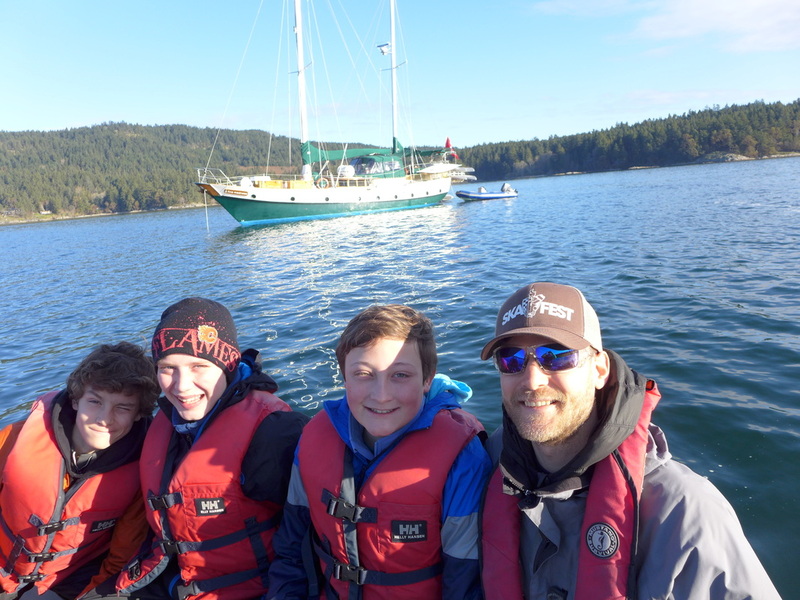 We motored out of the Inner Harbor and searched for some wind as we sailed past Chatham, Discovery Island, and Cordova Bay. Alas, not much was to be found. However, this did leave time for practicing some serious sailor skills. Each student was given a rope (now called a line on board) and taught the basic knots; the Bowline, square knot, stopper knot, sheet bend and even the clove hitch. For some, these were easy. For others, it took a lot of practice to get each knot right. 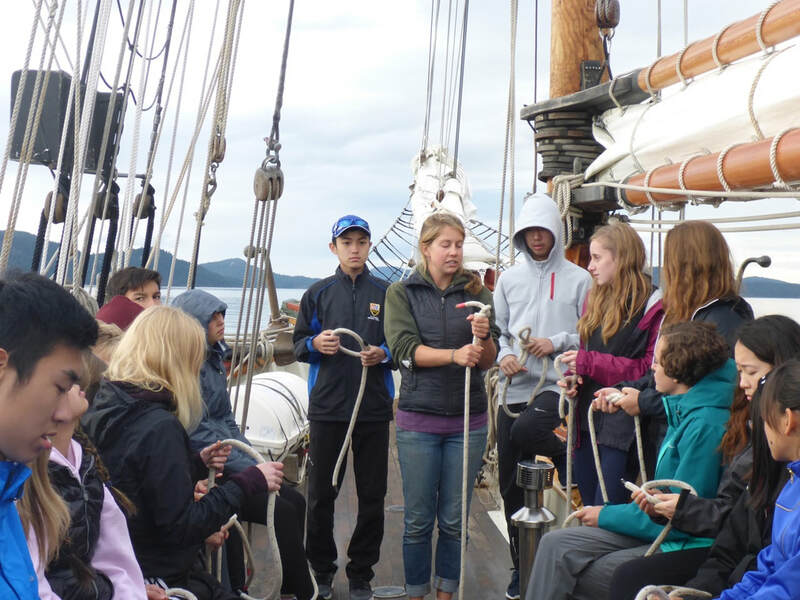 The SALTS program had given the students a good reason to learn these knots, because each student was given a log book, in which they could keep track of the skills they had learned over the course of the sail, and use them to earn responsibility around the ship. Cayla teaches the sheet bend knot using her excellent Kraken analogy. The students began right away with their first watches on board. They took turns being lookouts at the bow and stern, being on helm, monitoring the radio and even being on standby, should the bosun need assistance on deck. The mood on deck was cheerful even in the drizzling rain. It was a great day to start out with on the water, with no waves in sight. 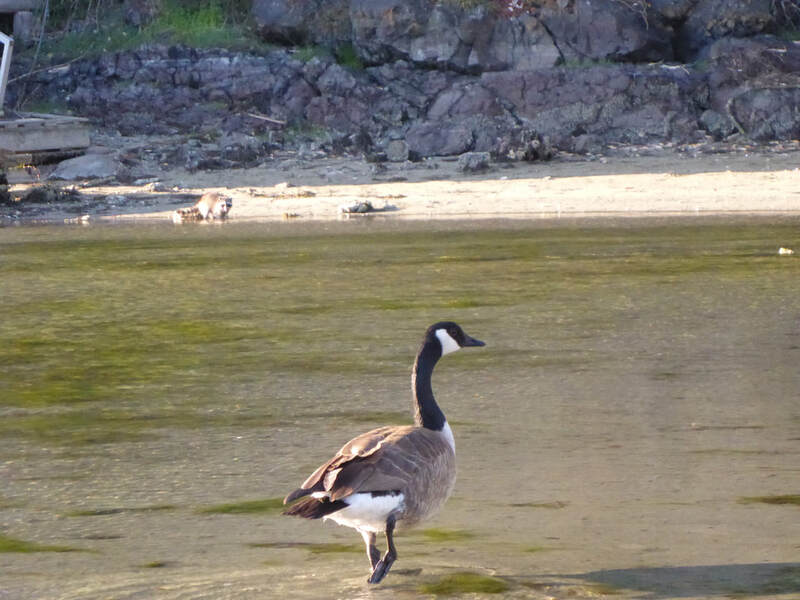 That evening, we anchored in Winter Cove, near Saturna Island. 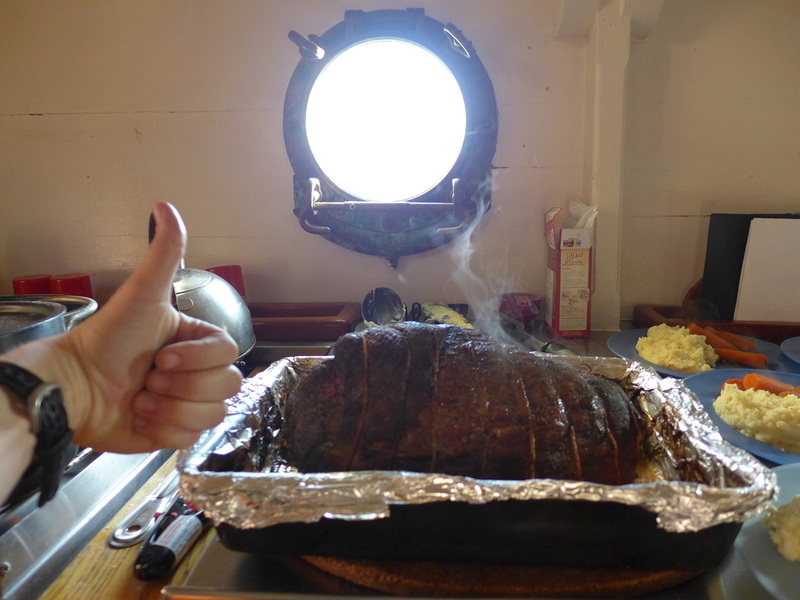 We enjoyed an amazing dinner on deck, courtesy of the ship's cook, Saidy Coyne. Despite the galley area being a bit tight for the number of students on board, Saidy and the crew shuffled each student through the galley and back up on deck with a warm, healthy meal to keep them going through the night. The food was so good that almost everyone went for seconds, and even thirds. As the evening darkened, it was time for games on deck. We played an ocean version of Camouflage, which involved lots of hilarious hiding spots around deck. Then it was time for a classic SALTS tradition; Mug up! Everyone squeezed into the galley to hear Steve and the Caylas play some classic tunes on their guitars, bass and mandolin so that everyone could sing along. ​We each got a song book, so there was no excuse not to join in. It was great to hear so many young voices echoing out of our warm vessel over the dark waters surrounding us. Cayla teaches the students about how to launch the dory. The following day, we woke to cloudy skies and a light drizzle. The students had each done a one hour anchor watch overnight to ensure that the ship was safe, and that the anchor wasn't dragging along the seafloor. 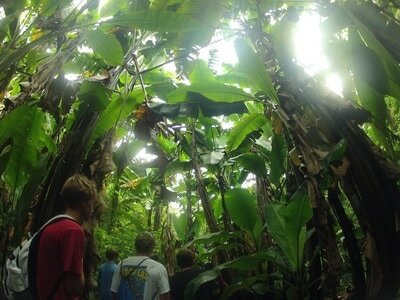 Despite this interruption in their sleep, the students were all in fine form and ready to explore. 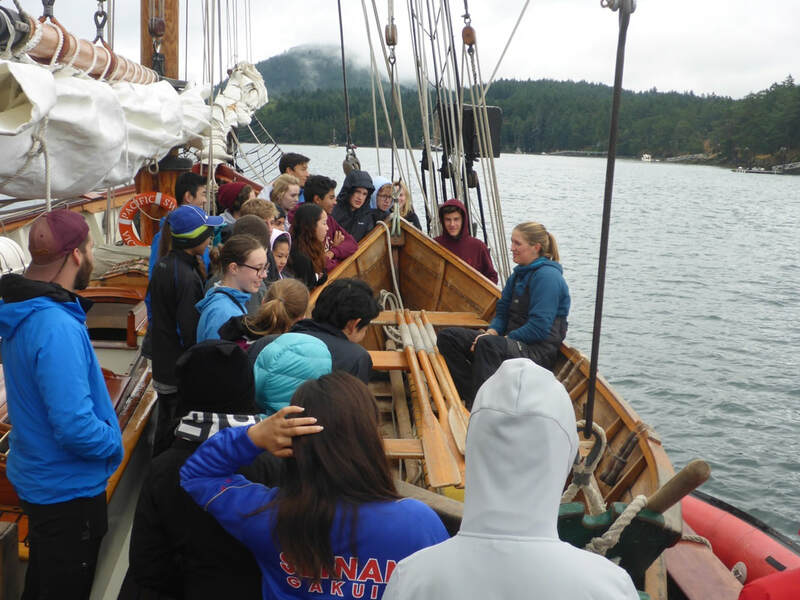 After all the ship's duties were completed, Cayla taught the students about the smaller wooden vessels stored on the deck of the Swift, known as Dories. The dories carried up to 8 people at a time, and had to be paddled by four strong young sailors. 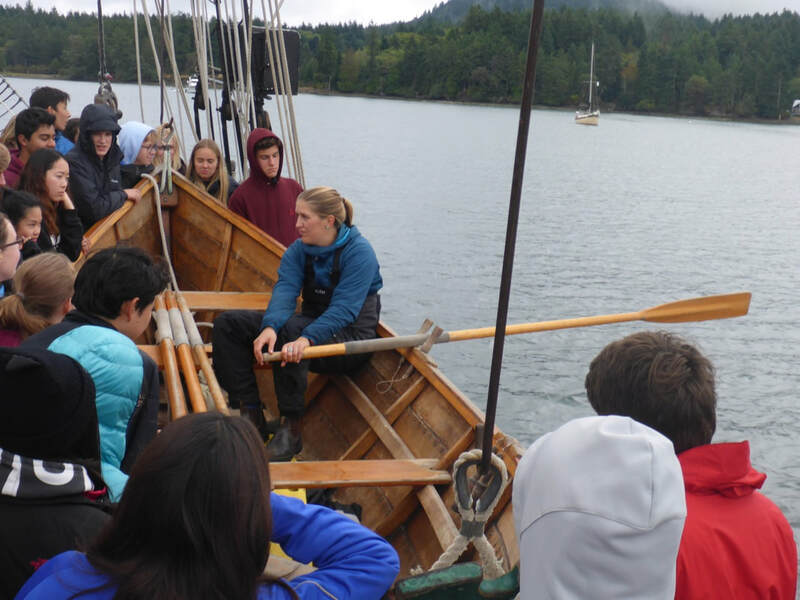 The students helped in the process of raising and lowering the dories into the water. Each watch took their own Dory to shore. This was quite a process. 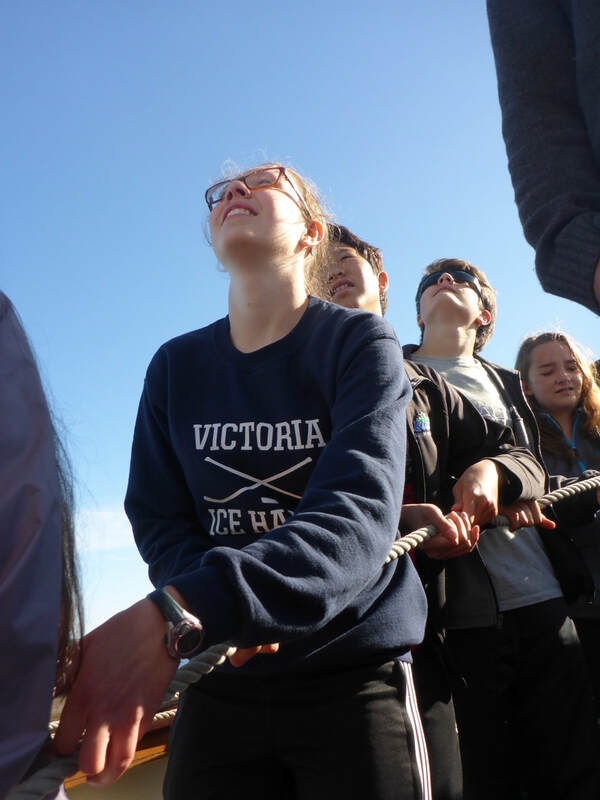 Although I found it exciting, the students were a bit rattled by the tippy wooden boats, and paddling them backwards definitely proved a bit of a challenge. 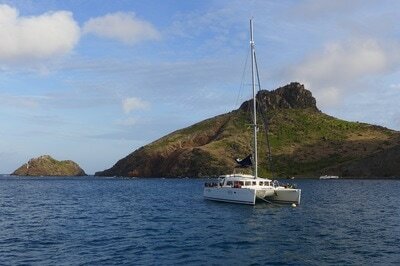 Once we paddled to shore, we met up with the crew of the Pacific Grace, whom were anchored alongside us. 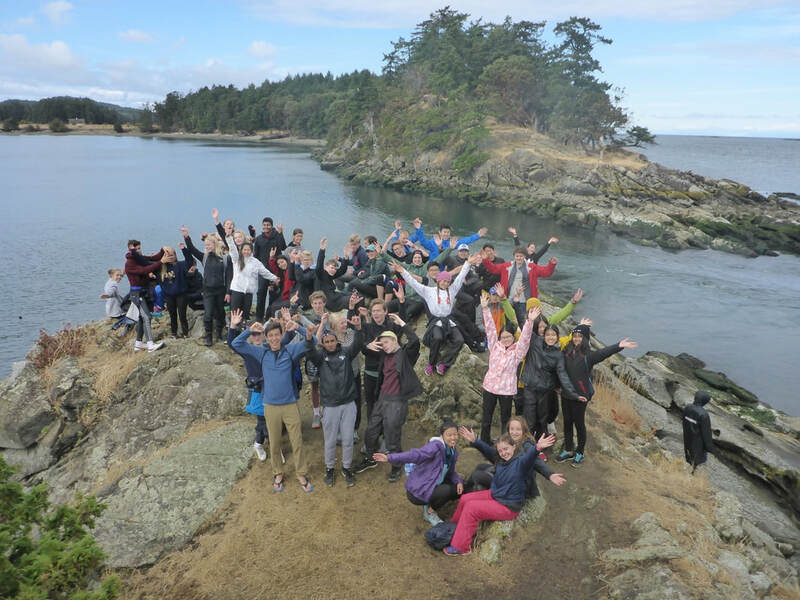 We played some really fun group games in the recreation area before starting a hike towards a tidal falls area, part of the Winter Cove Marine Park. 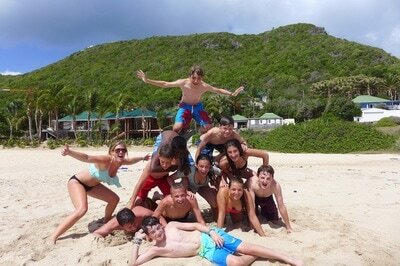 The SMUS crew at Winter Cove. The tidal falls was really amazing to watch. The changing direction of movement of the waters between Winter Cove and that of the nearby Georgia Straight caused visible rapids to surge all around us as we looked out from a rocky outcrop. Asta's primo dorkiness on display at the tidal falls. 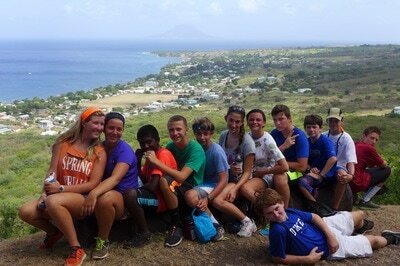 After our hike, it was time to head back to the ship for lunch. 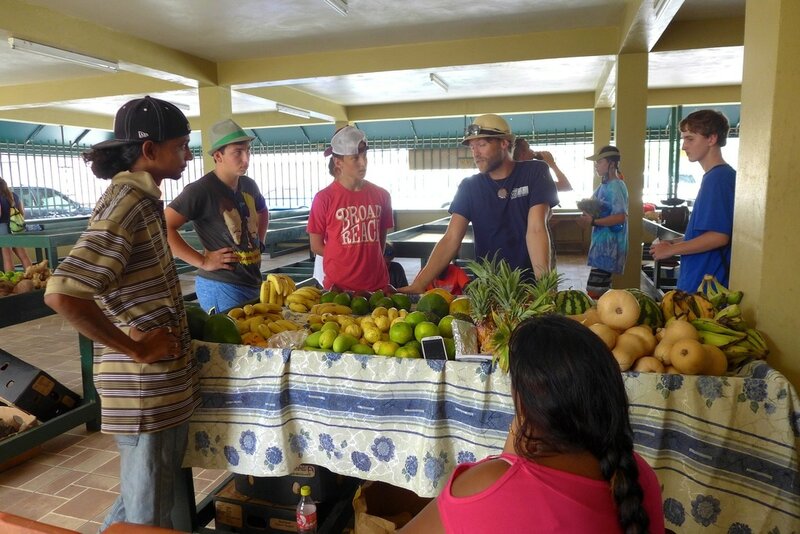 The students were responsible for all the ships' duties, including helping Saidy with meal preparation, dishes, and tidying the vessel. Everyone was busy throughout the day, but they still had some time left to relax in the sun and practice their new skills. The following two days were spent learning the basics of sailing. 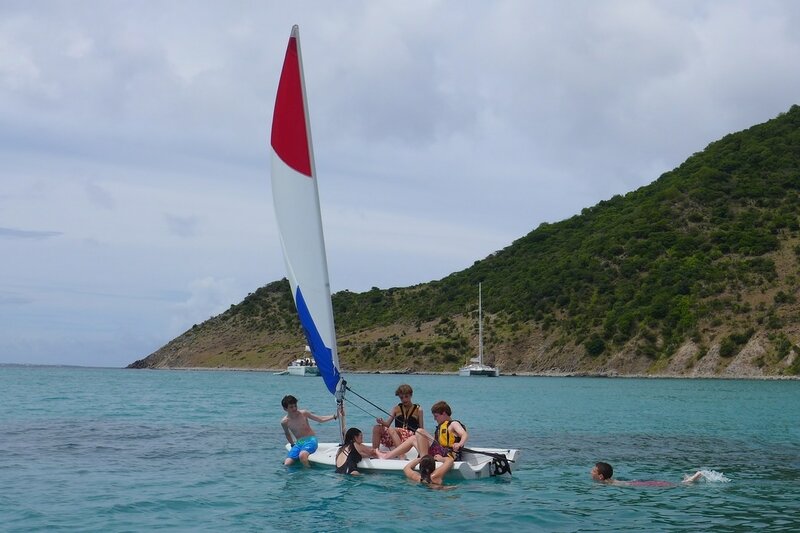 The students were taught about how to coil lines, what the parts of the sails were, and how to safely raise and lower sails as a group. They were even allowed to put on a harness and climb to the top of the mast, as well as to furl sails on the end of the bowsprit. Steve was there helping the students every step of the way. 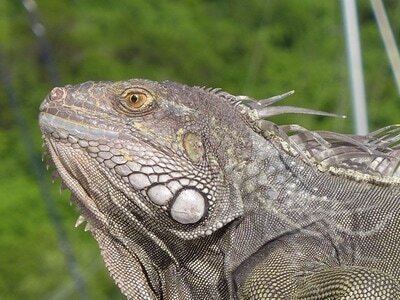 He was calm, patient, and gentle with the students, which made all the difference in the way they learned. 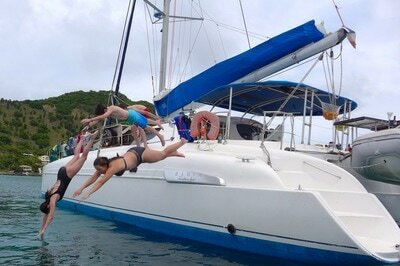 Students from SMUS chilling in their harnesses on the bowsprit. Watching the students work together to raise the sails reminded me of why I love sail training programs so much. Not only do they bring students together over a common goal, they also allow for each person to contribute what they can to the good of the whole community on board. 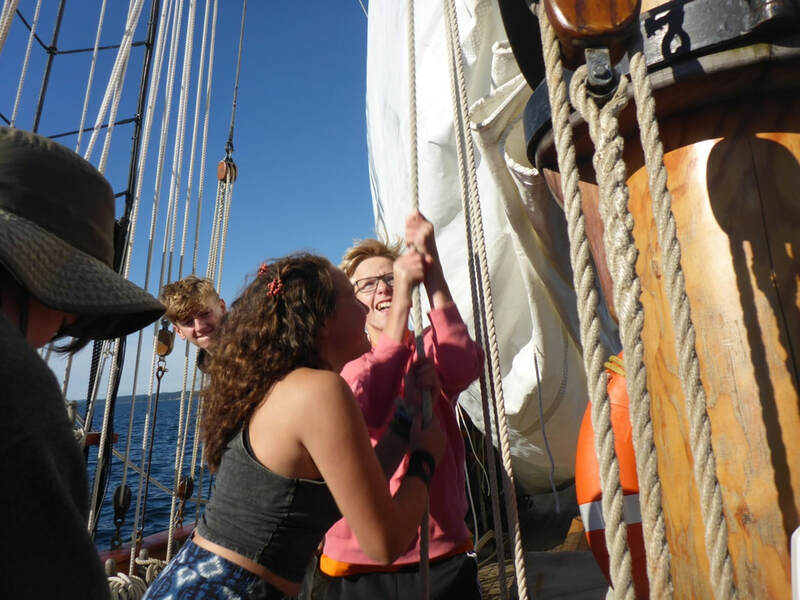 The more adventurous students helped to furl and unfurl sails aloft and on the bowsprit, while the more culinary inclined students joined Saidy in the galley, or talked with Tristan and Steve about the sailing life, and completing their logbook requirements. Everyone seemed happy, relaxed, and genuinely engaged. 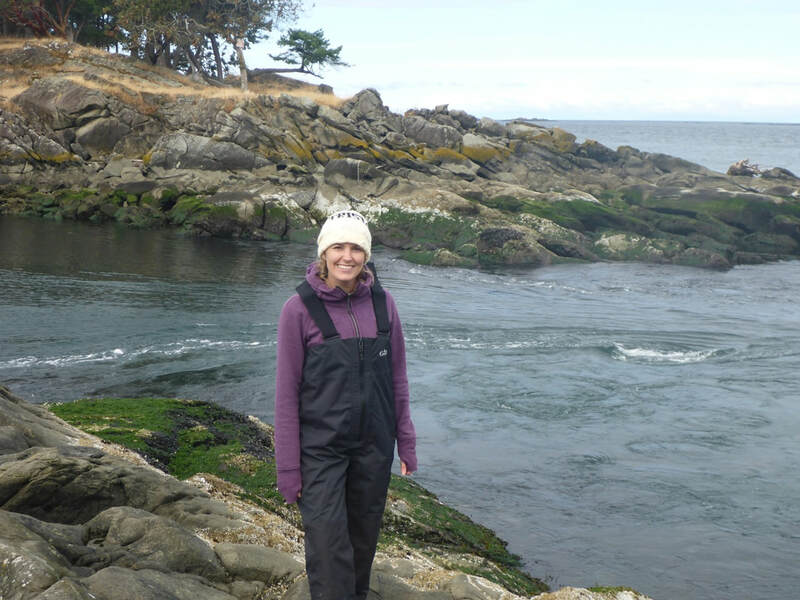 I was so happy to be right where I was with the Pacific Swift. 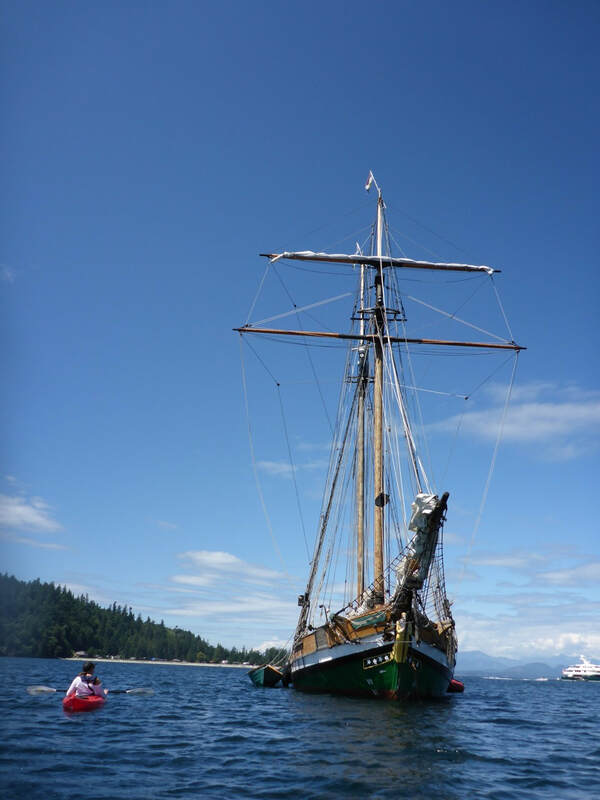 The Pacific Grace Sailing through the Gulf Islands, as seen from the decks of the Pacific Swift. At each mealtime, we gathered together to discuss the day and to hear stories read to us by our watch leader. There was a Christian element to each story, but it also connected directly to the experiences we were having on board as well. These stories were followed by really interesting and honest discussions with the watch. Each day was so unique, and time passed differently on deck than it does at home or at work. 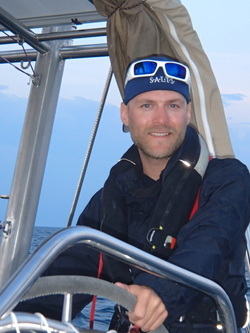 I was so happy to be sharing my love of sailing and the sea with students once more. 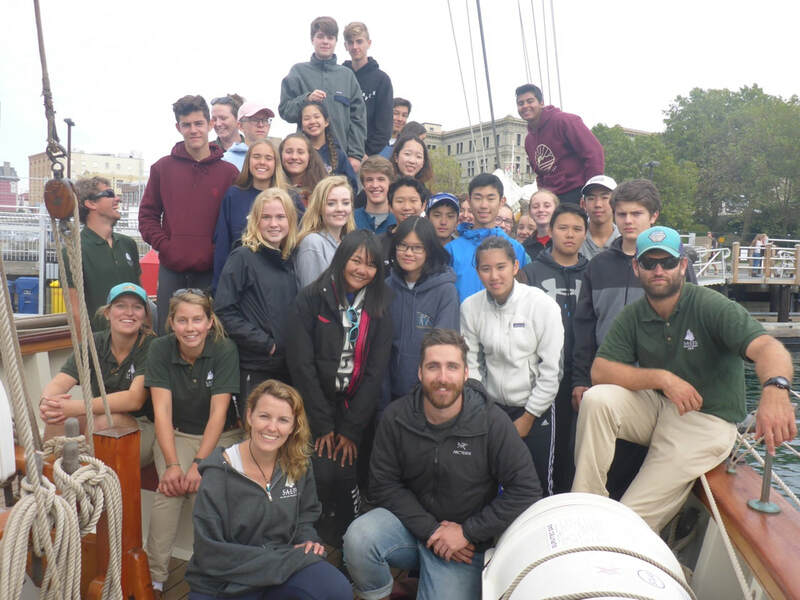 SMUS houseparent Jake McCloskey joined me as chaperone on this amazing adventure on the Pacific Swift. 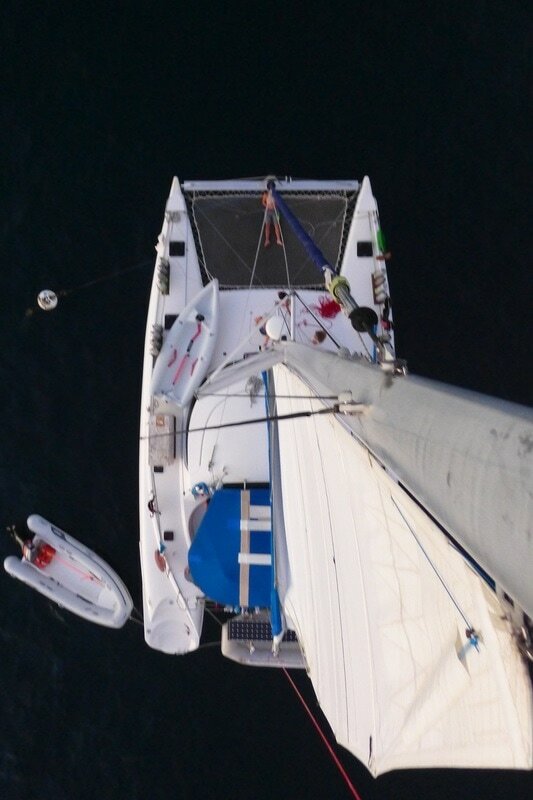 One of my favourite moments on board was on our second to last day of the sail. 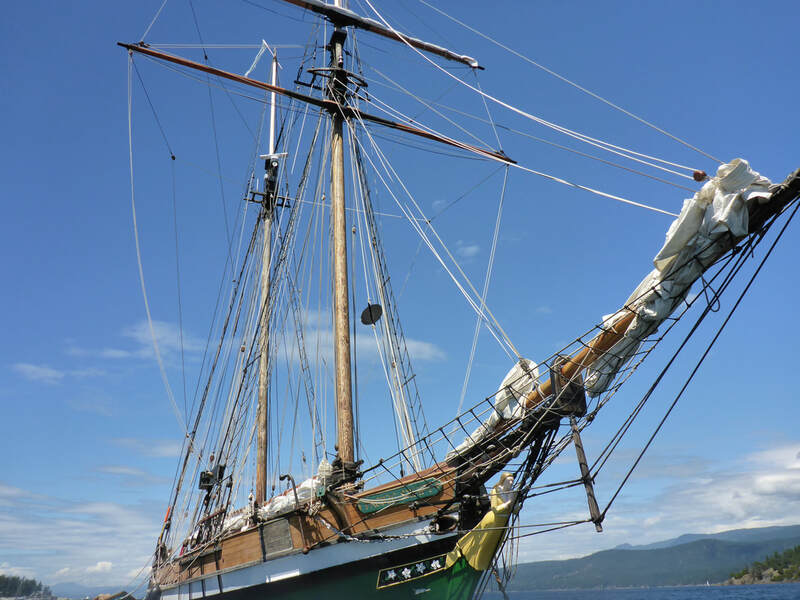 We woke that morning with the boat anchored just outside of Cowichan Bay. 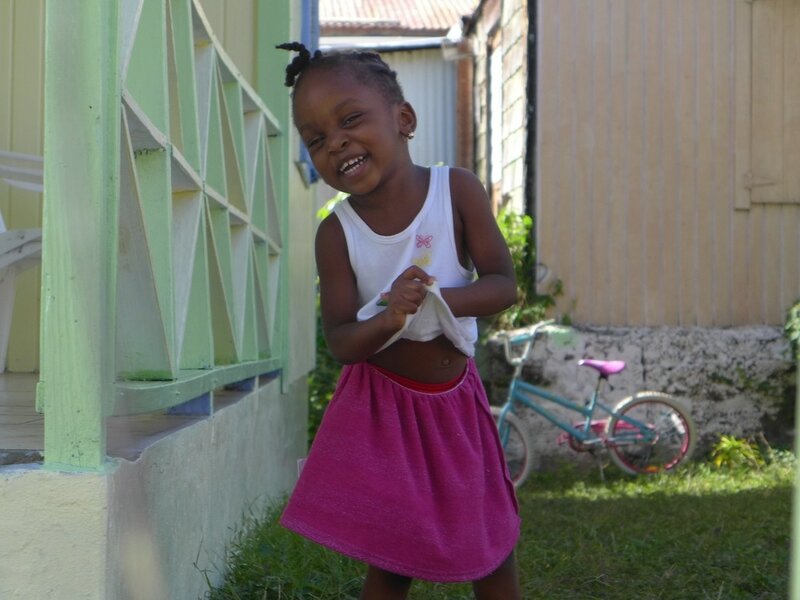 The sun radiating down warm fall heat, and everyone was in a great mood. 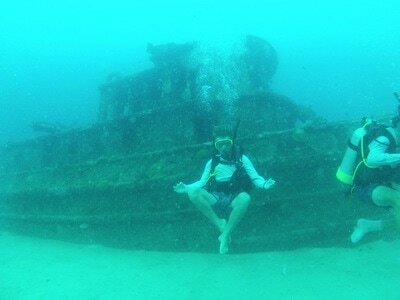 We were having a more relaxed morning, with no pressure to pull anchor and dash away too soon. The students were content practicing their knots, sunbathing and playing cards, when someone suggested the idea of a swim. At first everyone seemed a bit incredulous, but when Steve rigged up a line so that we could do Tarzan swings off of the bowsprit, the students got into it! 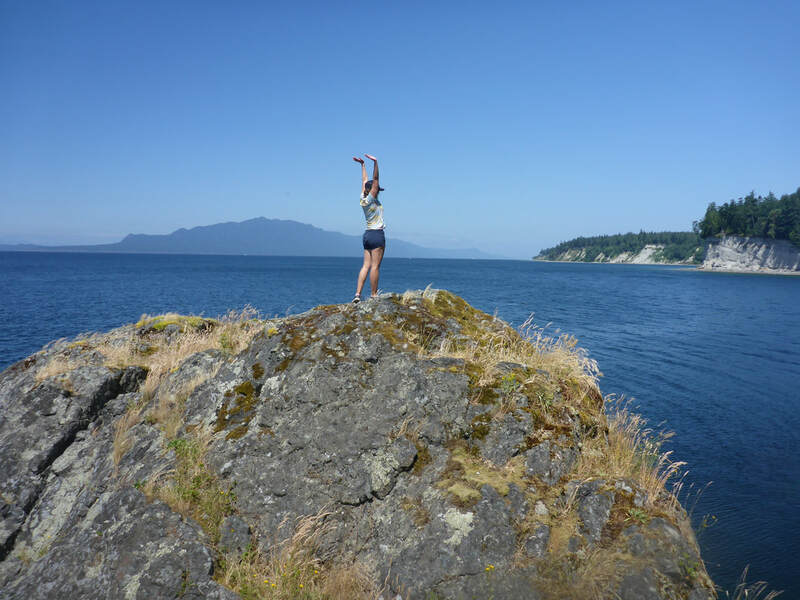 We all lined up in our bathing suits, ready to jump into the briny, cold waters of the Pacific Northwest. Though the students were far braver than I was about it, I couldn't resist an opportunity to swing off a tall ship into the sea! Asta looking really pensive before a drop into the cold waters of BC! We spent our last night anchored just outside of Discovery Island, located just in front of Cadboro Bay, where I currently live. 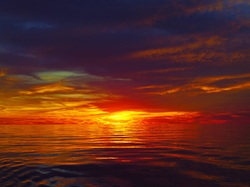 That night, I called my husband from the deck of the vessel, in awe of the beautiful pink sunset that we watched slowly form and then disappear under a blanket of new stars. I felt so at peace with the world that night, and so happy to have a career where moments like this were available. Andrew woke the next morning and took photos of the vessels from our living room window. We could not have been more excited! Overall, I think the Grade 10's had a really positive experience on the SALTS program. 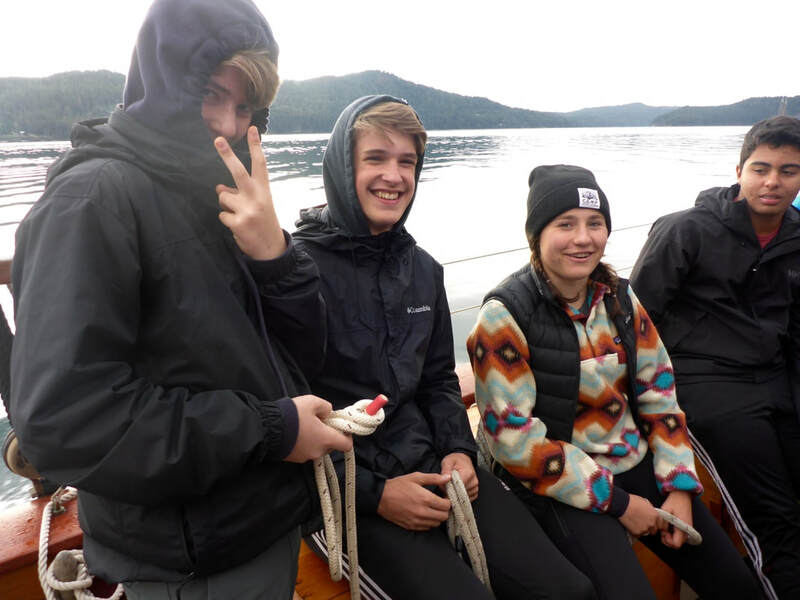 A little rain and some tippy boats did nothing to deter these brave students from having a good time and getting to know one another a little better. It was really cool to see new friendships form between students who had gone to school together for years, but never had the opportunity to truly connect. Connecting is one thing that living 24/7 with 26 people will do for you very well! I'd like to send a huge thank you to the amazing SALTS team, both on the water and in the office. You provided an incredible student experience, and taught me a lot about how an efficient teaching vessel should be run. Special thanks to Jake McCloskey, who was my co-chaperone on this exciting adventure, as well as the SMUS experiential education department and Pete McLeod, for letting me live another one of my dreams! 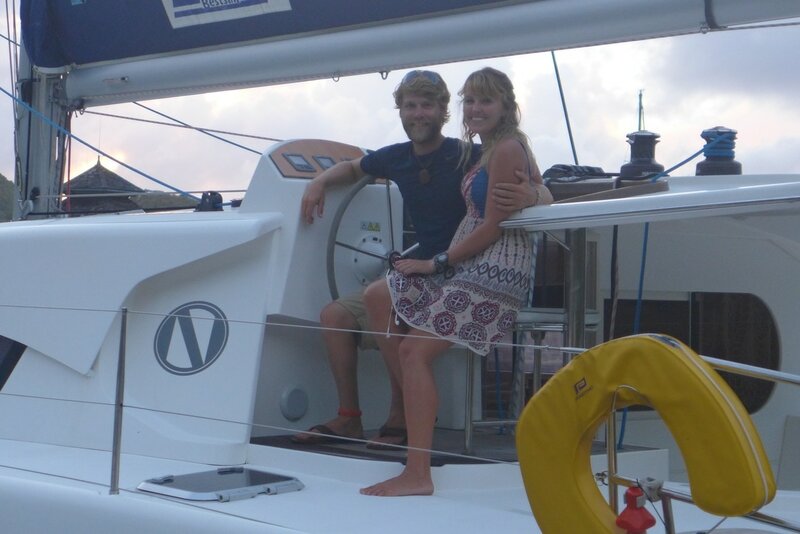 Here's to many more sailing adventures! Two school years with Class Afloat have come and gone. What a ride! 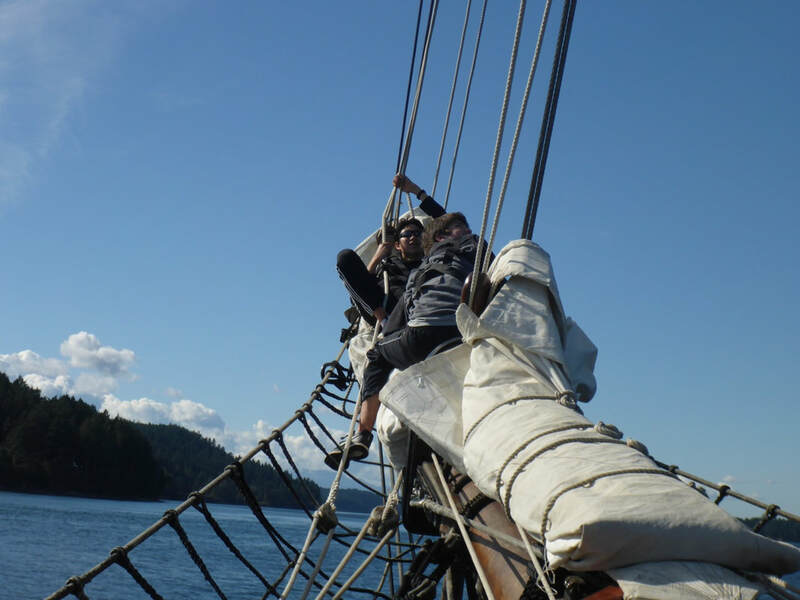 Asta and Andrew are now processing the experience of a lifetime aboard the Tall Ship Gulden Leeuw. It's hard to put into words what reflecting on an experience of this magnitude is like. Some days, it feels a bit like the last two years of our lives were a dream. ​A long, exhausting, mentally complex dream! When I was a kid, I used to watch a TV show called "Breaker High". It was all about a group of teens (including the adorably awkward Ryan Gosling) who went to school on a cruise ship and sailed country to country while taking classes and experiencing plenty of dramatic social situations. ​I remember thinking to myself, "That's going to be my life." It was so easy then to choose life goals. 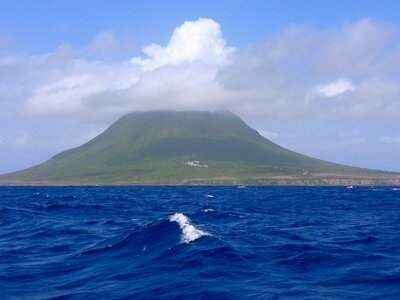 I wanted to swim with sharks and dolphins, and I wanted to live on a boat while seeing the world. I never thought I'd be playing the dorky teacher role, but hey, I knew what I wanted. Knowing what I want in life has always been a struggle for me. It took me forever to decide what really ignited my passions and made me want to work. All I knew, for most of my twenties, was that I couldn't do a regular 9-5 job. I had to do something that I truly loved, something that made me get out of bed in the morning and really appreciate my life. It was only when I went back to the memories I had from childhood of my big dreams that I realized what I truly wanted to do in my career. 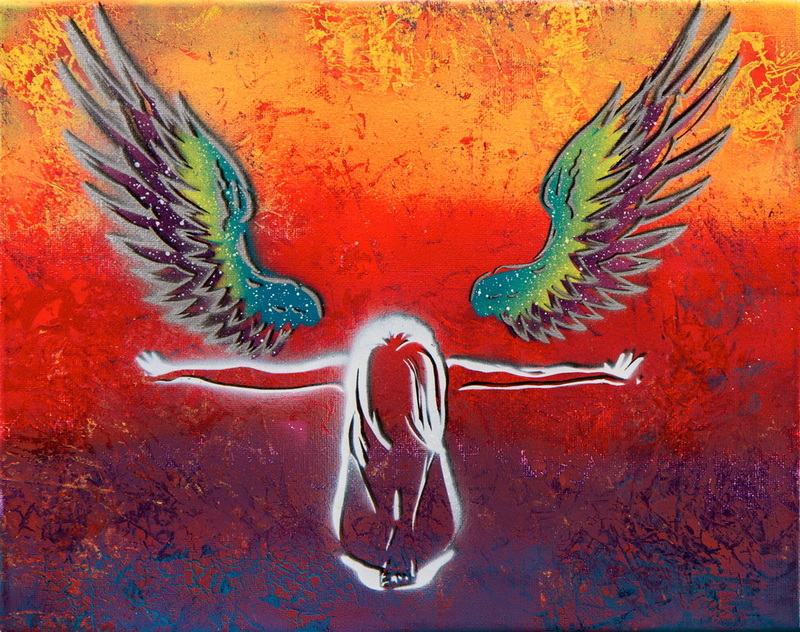 After a lot of time and energy was spent trying to "find myself", I forced myself to consider what deep down I knew I had always really wanted. 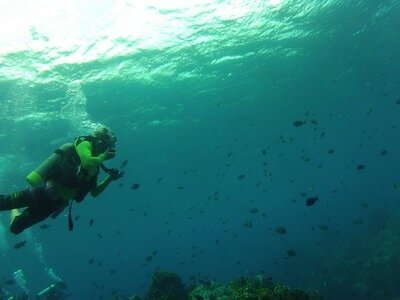 That consideration made me want to make a dream as crazy as Class Afloat a reality. I fought through a lot of doubt, apathy and laziness to make it happen, but I am so glad that I did. Having a life long dream come true is never quite as you expect it to be. There were moments where I was in bliss, the happiest I have ever been, seeing the world and allowing it to see me. Then, there were other moments. Hard, challenging moments. Moments where I wasn't sure we were going to be all right. Moments where I worried for the safety of the many amazing students on our ship. Looking back on it now though, the experience feels like a wave. There were ups and downs, peaks and crests- an experience in many ways similar to the ocean itself. One thing I know now about this experience is that I am so blessed to have found a partner who shares the same crazy dreams. Andrew is truly my hero and someone I look up to daily as a source of inspiration. As shipboard director for the program, his strength and quiet compassion is what got all of us through some very difficult and challenging experiences. I can't tell him enough how proud I am of what he's accomplished. Andrew and I put our heart and soul into the Class Afloat program. We whole heartedly believe that experiential education is the key to true growth and learning. I think we probably learned as much as the students did about life and education. 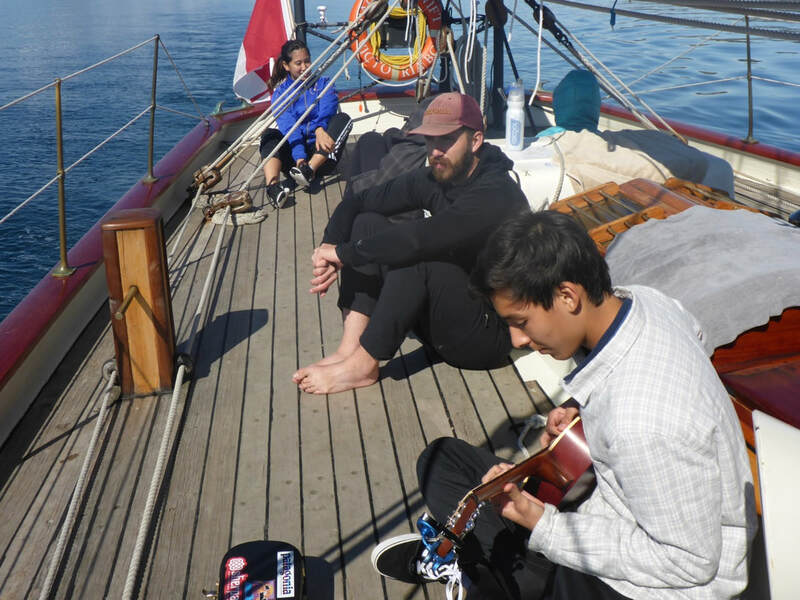 We learned it not only by being bound to our students in a classroom, but being bound to one another as a community; a moving universe surrounded by water and sky. I know now more than ever is that life is your best teacher, and experience is your chance to practice being yourself. I also know that being a teacher is often really the practice of being a student. I hope to share some of our experiences on Class Afloat in upcoming blog posts. 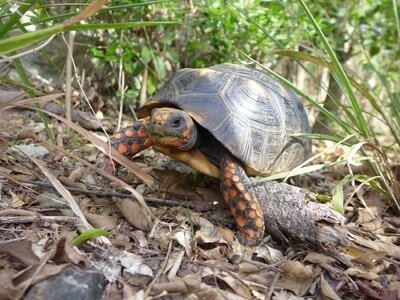 My apologies if the posts are not regular as I am just returning to the blogosphere. If you're interested in attending, Andrew and I will be hosting a talk on the evening of October 3rd, 2017 about our experiences. It's called "Life on an Angle" and it will take place at the Royal Victoria Yacht Club in Victoria, BC. Here's a link to our Facebook event. The event is by donation and proceeds will go towards supporting a student on the sail education program of their choice. Hope to see you there! 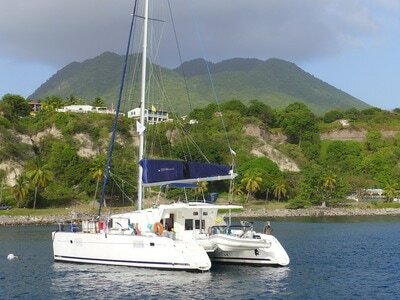 Caribbean dreams sailing and scuba with broadreach! Asta and Drew spent two summers in the Caribbean with Broadreach Global Educational Adventures! 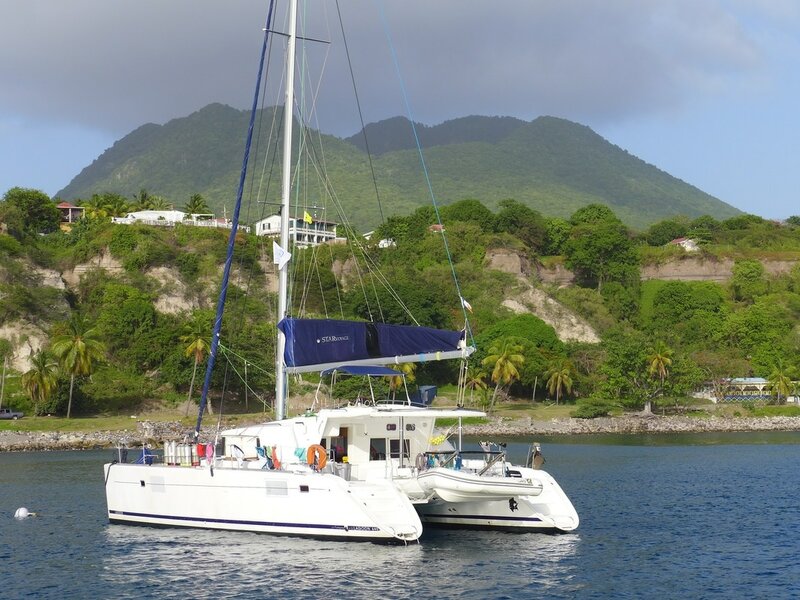 Drew was a skipper of some beautiful boats including Lagoon 450, Nautitech 441 and Fontaine Pajot catamarans for the Underwater Discoveries SCUBA Voyage and Beneteau Cyclades monohull for the Caribbean Sailing Adventure. 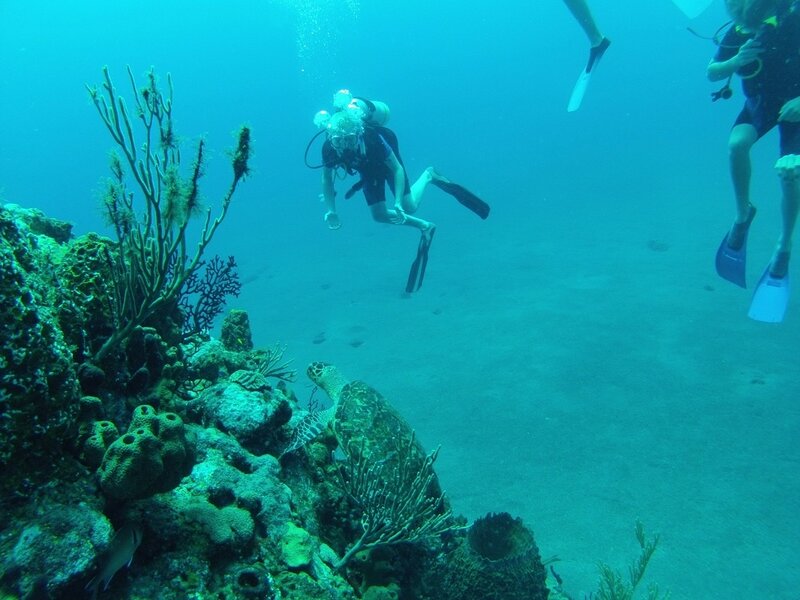 Asta was a marine biology instructor for the Marine Biology Voyage which included a stop at the Saba Ecolodge! 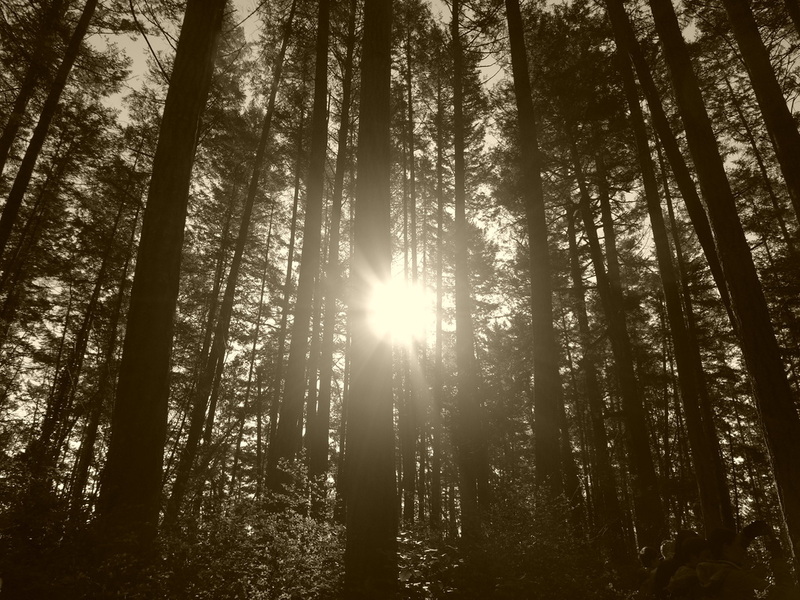 Here's a track I made a little while ago and I thought that I would put it on my blog for MLK day. Enjoy! Late night musings on Sea Dragon as we sail across Lake Erie on our way to the Welland Canal.